Talk about all things M*A*S*H -- the novel, the film, the television series, even the play. Not to mention the spin-offs, merchandise, cast, crew and anything else you can think of to talk about. I downloaded AfterMASH episodes from YouTube. My wife and I started watching them this evening. The 1st episode was actually pretty good. I know the 2nd season isn't too good but so far I'm enjoying it. It would be great if it ever made it onto DVD. I'd buy AfterMASH on DVD. Most of the episodes on YouTube are in rough shape. Even worse, unless another copy has surfaced, one episode is only available in a foreign language! The one episode, By The Book, is the one in the foreign language. We are up to the last episode of Season 1. The 1st season is actually very good. After getting it out of the system that it isn't MASH it's really a great show. Too bad they made changes to it in season 2 and ruined it. I wasn't such a fan of AfterMASH. I watched the first couple of episodes. I thought the show had run its course but it's understandable that there is an allure to watching what happened to the characters after the war. And there's the well known trivia about how the cast voted and the ones who wanted to keep going were the ones on AfterMASH. Morgan, Farr, Christopher. Interestingly enough - somewhere in the depths of time, Morgan says in one of the MASH retrospectives that the cracks were beginning to show in season 11. We started watching season 2 this evening. I have to admit it's funny but it was too drastic a change from season 1. I can almost take Klinger being on the run but Colonel Potter's wife Mildred is too different. 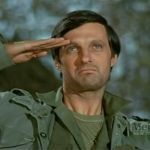 They made her dumb which not only goes against her character in season 1 but goes against everything Colonel Potter said about her in M*A*S*H. It's too bad they switched it to a night with tougher competition and made all the changes to the show. I feel if they left it the way it was in season 1 it could have gone on for a few seasons. I'm going to be reviewing episodes of AfterMASH starting in September, timed to coincide with the show's 35th anniversary. My plan is to start watching and reviewing next month. I may post some random thoughts and comments here as I go through the episodes.